The 22-acre site of Finkl Steel has been sold to Sterling Bay. 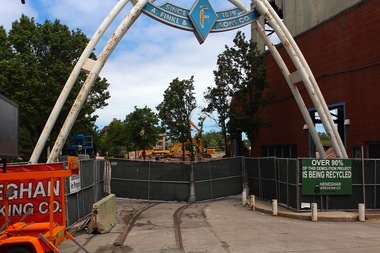 LINCOLN PARK — Developer Sterling Bay has closed on its $100 million purchase of the Finkl Steel site, according to a published report. Crain's is reporting that Sterling Bay completed the sale, which was said to be imminent in September. Sterling Bay is known for redeveloping properties and bringing in major tenants like Google and Twitter, but it will need to have changes made in the North Branch Industrial Corridor plan to continue with its development of the 22-acre site. The city's Department of Planning and Development holds a public meeting on the issue at 6 p.m. Tuesday at UI Labs, 1415 N. Cherry Ave., and Ald. Michele Smith (43rd) is rallying support for her proposal to devote some of that land to a major new park. Sterling Bay has been buying up properties in the area, including the Gutmann tannery and Lakin General tire recycling, and is said to now hold 35 acres total. It could also still make a play for the Department of Fleet and Facility Management lot at 1685 N. Throop St., which Mayor Rahm Emanuel announced in August would be shifted to Englewood to free up the property. Otherwise, Sterling Bay has not announced its plans for development in the area. The company did not immediately respond to requests for comment.